There was a new caddie on the bag, but it was still the same five-time major champion hitting the shots. 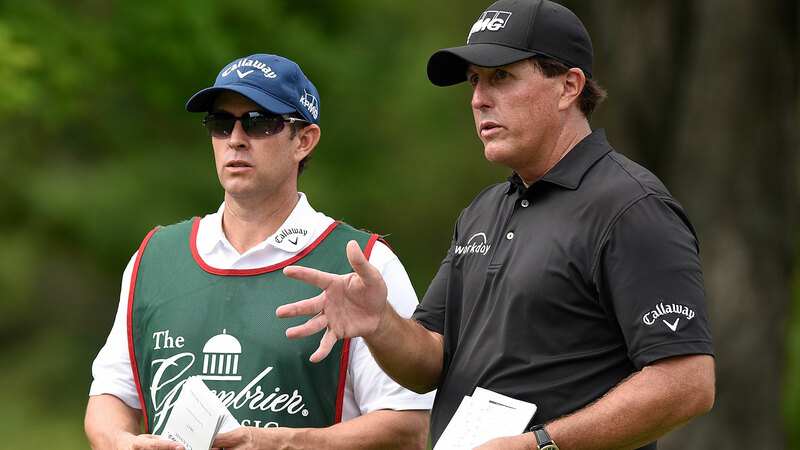 Phil Mickelson produced a mixed bag during the first round of The Greenbrier Classic, a 3-under 67 that marked his first round since his split with longtime caddie Jim “Bones” Mackay and one that left him six shots off the lead. Mickelson started slowly with six pars on The Old White TPC, but then gave fans reason to cheer with a number of accurate wedge shots. He also hit a spectator in the head with his approach to the par-4 11th before, in classic Mickelson fashion, getting up-and-down to save par. He made his lone bogey of the day on No. 14 before closing with birdies on Nos. 16 and 17. It was a solid effort for Mickelson, but it still left him staring up at more than a dozen names on a day when 53-year-old Davis Love III set the early pace with a bogey-free 63. This is Mickelson’s first start since a T-9 finish at the FedEx St. Jude Classic last month, as he skipped the U.S. Open to attend his daughter’s high school graduation. Days later he and Mackay released a joint statement detailing their split, and Mickelson announced that his brother, Tim, would serve as his new caddie for the remainder of the 2017 season. Tim Mickelson was formerly the head golf coach at Arizona State and currently also serves as the agent for Jon Rahm. It was announced Thursday that Mackay will join Golf Channel and NBC Sports as an on-course reporter beginning later this month at The Open.